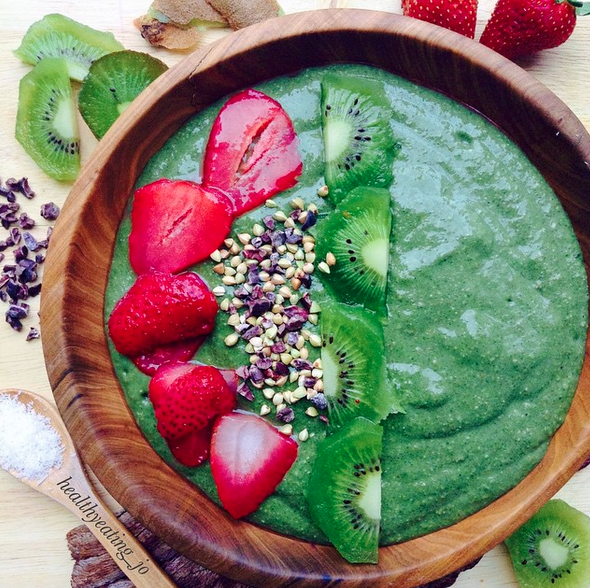 Feel absolutely super with this chocolate superfood smoothie bowl by the Healthy Eating Jo! It’s featuring superfoods chia seeds, maca, psyllium husk, and spirulina! Don’t worry – even though it’s mostly green, you won’t miss out on the chocolatey taste in this bowl. This nutrient-packed goodness might just be what you need for a early morning or mid-day boost. Blend until smooth, and enjoy! You can top it up with cacao nibs, raw buckwheat, strawberries, and kiwi.